Enjoy this in big size. BTW did you notice something different in the Old & Antique versions from the original one? 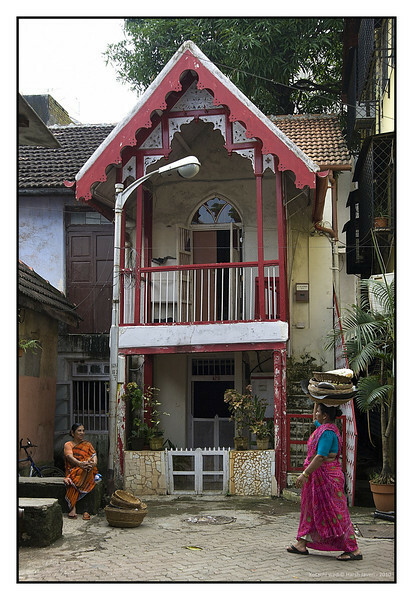 Khotachiwadi is a heritage village in Girgaum, Mumbai, India. Houses built are made from the old-Portuguese style architecture with trellised balconies and latticed windows. It was founded in the late 18th century by Khot,a Pathare prabhu, who sold plots of land to local East Indian families. There used to be 65 of these houses, now reduced to 28 as old buildings are being pulled down to make way for new skyscrapers. They are all good, but I think I like this one best! So love this Harsh. Hope you are well. Miss you! Sorry, I also don't understand this as the pics appear perfectly sharp at home and work. Besides if there was a problem then the others at Smugmug site would have complained immediately. For the last couple of months your pictures appear to be 'fuzzy'. They are not sharp at all. And I have verified this with several friends who a;sp receive your pictures. What's up. There's so much to look at in this shot! This is very subjective as the base image is very nice. My preference is image 1 (Colour) and image 3 (Sepia) as they capture the essence of olde world charm!